As our host hotel some com- petitors friends and and families checked in and and really enjoyed their stay The athletes were excited at at at registration and and a a a a a a a a a a a a bit nervous and and anxious as they prepared to to carry their energetic spirits to to the the the stage! 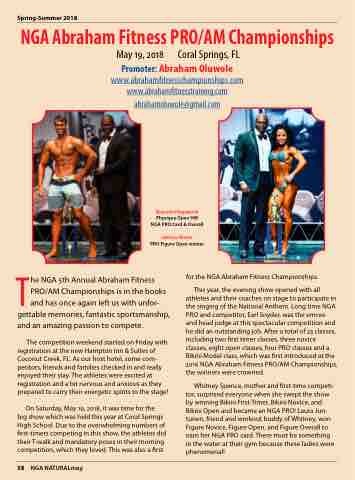 the winners were crowned Whitney Spence mother and first-time competi- tor surprised everyone when she swept the the show by winning Bikini Bikini Bikini First-Timer Bikini Bikini Bikini Novice and and Bikini Bikini Bikini Open and and and became an an an an NGA PRO! Laura Jun- tunen friend and and and workout buddy of Whitney won Figure Figure Figure Novice Figure Figure Figure Open and and Figure Figure Figure Overall to earn her her NGA PRO card There must be be something in in the the the water at at their gym because these ladies were phenomenal!